Due to technical difficulties, I have no images available of the memorable events of the past weekend. The Wheels of Progress do continue to turn so stay tuned because some incredible shots will be posted here soon. I plan to start working with the stuff I captured this afternoon @ Great Day In Tuscaloosa so get those digital devices out and start posting & shooting me your images so I can share them with all the citizens of Zero, Northwest Florida. Robert Register,25,teaching @ Druid High. I saw Coach at John Bedsole's funeral. During the last few years every time I saw him around town I always asked him about his cattle farm. He always played along. >When he was run out of his head coaching job at DHS in, what 72, 73?, he was interviewed and asked what his immediate plans were. He told Woof or whoever he had somewhat less than 500 head of cattle that needed attention and that he would remain with the Drivers Ed. program at DHS. The media ran with the story, he had two cows out on his place on Middleton Rd. Gotta love him, gotta miss him. No body could reel him in except Maxine. I promised Ms. Windham I'd post this stuff. I like it. I wish Ben would go out there today and start digging up bullets so he could get busted by his sacred left wing kook Alabama Histerical Commission.What I glory in about these pictures is poor old Ben wrote about a zillion editorials against the flying of the Confederate Flag. He might have hated the flag but sho' nuff loved tearing up the battlefield! You know there was a group named Stonecross (all Dothan locals) that have yet to make on your blogs. A unique feature about the band was that this was the first band for all five members. Circa 69 to 72. I've got pics. I got email from Sonya's sister Sharon and she says her birthday is coming up in February so we have time to get those tapes. Ive not heard from Jason at all yet. I wonder if he doesn't read email or just is so busy. Ive not written him just was waiting to hear from you if you hear from him. Sharon filled me in on Sonya and said she lives in Florida. She moved to Panama City during her Jr yr of high school to live with her mother since her parents divorce and got married young. She didn't pursue the music career because of the marriage but she has continued to sing and they moved to Jacksonville Florida. not sure if that is where they are now but Sharon said that Sonya used to perform somewhere there singing with the Big Band style of music and that her voice was rich and full and still beautiful. Sharon is going to see if she can get me a Cd of Sonya's voice now at some point. I dug out my reel to reel tapes and recorder and tried to listen to them. I have Sonya singing 11 times but she did one song twice so there are 10 total songs however the quality of these tapes are terrible and the one we have her doing most of the songs on looks like the tape was recorded backwards (not on the shiny side). I had a hard time making out words plus it drags or goes too fast. its going to take a miracle worker recording studio to make them sound good. Only 2 or 3 sound decent to me. And a few she starts off and you hear it and then it goes low and you can hardly hear it or starts off like that and then suddenly the sound goes up. Anyway I went thru and tried to figure out what the titles were and looked them up online to find out who the original artist was. There is only one song I have been unable to figure out because it goes too fast or too slow and I can't make out any lyrics. Even Mr Taylor says the name of the song and I cant make out what he is saying. At first I thought the song was called "Thank God I'm A Woman" and it sounds like he says the title like "Sometimes It feels like a man, then it feels like a woman" but that isn't it either. Sounds like Sonya does say "you're a woman" in the title but I cannot figure that one out. Any clues?. It sounds like a catchy tune but none of the lyrics that I came out with above I can find on the internet. Hopefully Mr Taylor's Grandson will contact me and have the original tapes that sound good. Id love to have copies of them myself. I just found out about your plan for the "Great Day In Tuscaloosa" yesterday. Did it transpire? I hope so and I am sorry I missed it. I got an e-mail from an old musician buddy named Jor Tucker out of the blue this evening and started to looking around the Internet and found your blog. Its GREAT! However I have notices that many (most (all)) of the early band pictures in T-Town are all white bands. True of the WTBC site and yours as well. I played in a few bands in Tuscaloosa from 1966-1972....most of the time in black bands like George Byrd and the Doves, The Session, Soul Survivors (mostly from Columbus MS), and once or twice with the Dominoes as well as with white groups like Gary Griffin, The Top Ten, The Soul Searchers (out of Northport), and a few others. How about some pictures from the West End of T-Town? I'll send you one or two tomorrow if you're intereted. Keep up the good work and I really like your blog. BTW I'll be the trumpet player on top of the car ;-)..circa 1969 outside the 61 Club or the Citizens Club I think??? great you are doing this. Take care. Yesterday, my brother had a TV on in his office when the news of the military base shootings came on. The husband of one of his employees was stationed there. He called her into his office and the minute he told her what was going on, she got a text message from her husband saying, "I am okay." The cell phone started ringing right after that. It was an ER nurse. She said , "I'm the one who just sent you a text, not your husband." She thought the message would be comforting, but she immediately knew she had to let the wife know what was going on She said, "I am sorry but your husband has been shot 4 times and he is in surgery." The wife left Southern Clinic in Dothan and drove all night. Miraculously, here is the photo I just received from my brother that was taken today in the hospital room. He is awake and will recover. His wife, who lives in Dothan , made it to Ft. Hood about the time he was waking up. Thought I'd share this great outcome. Alabama Army National Guard Maj. Randy Royer is recovering from the wounds he sustained during last week's mass shooting at Fort Hood, Texas, and the well wishers who have visited his hospital room include former President George W. Bush and current President Barack Obama. "ONE SHOT GITZZZZZZZZZZ 'EM ALL, MITTUH ROBUTT!" I have vivid memories of your brother because I met him the first time I ever met a rock star. For many years I remembered his name as being Felix Flaco. Only with the advent of the Internet did I discover that his name was Felix "Flaco" Falcon. In the spring of '72, I had a work-study job at the Student Union Building at the University of Alabama. I was 22 years old and was about to graduate with my B.S. degree. I was the maintenance man for the Union so,in my opinion, I had the best job on campus(plus every master key). All the student organizations were located in the Union so I got to know just about everybody. I got to know all the cats in the University Program Council,the organization that promoted concerts,so I got to work security at all the concerts which meant I got in free and was given a free T-shirt. The night before I met your brother, I had worked security for the Joe Cocker concert & had witnessed the whole show from the side of the stage. Cocker wasn't as animated as he usually was because he had fallen off stage the night before in Jacksonville,Florida. He'd cracked a rib and was wrapped in this huge Ace bandage. The next day at work somebody in UCP told me to drive my '62 Chevy Impala over to the Stafford Hotel to help shuttle Cocker's band out to the airport which is located across the river from Tuscaloosa in Northport. Right when I got there I saw evidence of the "Rock and Roll Lifestyle". While standing on the sidewalk in front of the hotel I witnessed Chris Stainton walk full speed right into a plate glass window. It almost knocked him down. He wasn't paying attention because he was reading a copy of Winnie the Pooh as he walked. There was a huge entourage but everybody got rides until finally everyone had left for the airport except for Joe and your brother. By the time they got downstairs,I was the only car left so they piled Joe's crutches and your brother's conga drum into the trunk of my car & off we went. Your brother and Joe sat in the back seat and Joe did most of the talking. The only time Joe had been to Alabama before was to record in Muscle Shoals. He was really curious about Alabama liquor laws so that's all we talked about. Stuff like dry counties, no dancing laws, not being able to walk around with a beverage in your hand laws, no open windows in bars laws,no draft beer laws,no Sunday sales laws,no words on your sign like "beer,wine,liquor"laws,etc. Felix was very quiet.I remember he looked exotic with his bell bottom pants and billowing black silk shirt.Seems like I remember him having a little facial hair. Seems like a moustache or a goatee. Cocker had his hair plaited in corn rows. I'd never seen that before. After we crossed the river, I asked Joe and Felix if they wanted a beer. They were ready so I stopped in a little store and bought a six pack. We all popped a beer and rode around the airport grounds until each of us finished our two beers. When we got to the plane which was parked at Dixie Air, everyone was already on board the plane and they were waiting on us. I'll never forget this gorgeous dark skinned girl with long black hair running off the plane to hug Joe's neck as we got Joe's crutches and your brother's drum out of my trunk. I've always felt that Joe and your brother had their stash inside Felix's conga drum. The next time I heard about your brother was in October of the same year when he got busted with Joe in Australia for weed. The cat you need to talk to is Joe Cocker. Joe & your brother appeared to be best friends and they were working in about the biggest rock & roll show to ever tour the world up to that time. Your guess on the stash was probably right. Thanks again. I'll try to reach out to Joe. 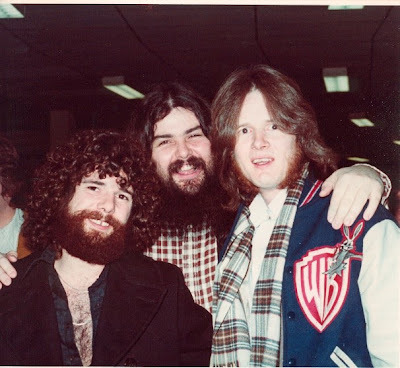 An old friend and bassist I played music with in 1970 had these pictures of himself (Steve Wasserman,darkhaired guy), our drummer (David Morton, shorter light haired guy), and me. We got together at the Atlanta Pop Festival. He found me on facebook, and sent me these. Thought you might get a kick out of what I looked like back in the lean and mean days. Who knew what lay ahead? I'm sure you all have seen the photo "A Great Day in Harlem", which captured 57 prominent jazz musicians in front of an apartment building in Harlem, New York. It's a photo that presents an iconic image of a music community. It's time to have our own "Great Day" on the steps of Reese Phifer Hall. Along with Ham Bagby, Thomas Wescott, and Mikey Oswalt, I want to invite you to the photo shoot for "A Great Day in Tuscaloosa" - a photo shoot that will try to capture the essence of Tuscaloosa's music community past and present. If you play in a band based in Tuscaloosa, played in one at one time, know someone who did, etc. - TELL THEM ABOUT THIS EVENT. To make the impact we are looking for, we need as many musicians in the photograph as possible. We want the entire spectrum represented. The event will take place on Sunday, November 22nd. We are going to start organizing around Reese Phifer at 2:00 P.M. Because hopefully so many people will be involved, we will have some leeway after that in terms of when the photo will be taken. Please make an effort to be there between 2:00 and 2:30 so we can get everyone situated on the steps. Since it will be taking place in late November, we won't have a lot of daylight available so we want to give ourselves ample time to get the perfect shot. Remember - this is a COMMUNITY event. We are relying on each and everyone of you to spread the word to people who might not get the initial invitation. Repost the link to the event, tell your friends, etc. It is our ultimate goal to have this photo hanging in every establishment that supports live music in Tuscaloosa. “Poe captures the essence of Duane Allman. He did his homework and got it right.